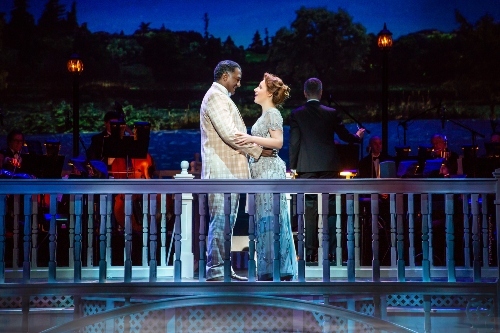 Norm Lewis and Jessie Mueller in The Music Man at the Kennedy Center. Photo by Jeremy Daniel. You’ll be in trouble (with a capital T!) if you don’t catch Broadway Center Stage’s production of “The Music Man,” playing now at the Kennedy Center’s Eisenhower Theatre. No seriously, this staging of the great American musical stars the Norm Lewis as the title slick-talking salesman, with tour-de-force Jessie Mueller playing opposite him as Marian Paroo. As if that’s not enough to make an incredible show, add in a stunning orchestra, vivid settings, and the University of Maryland’s stellar marching band. It’s just that good. Broadway Center Stage is a relatively new venture by the Kennedy Center, premiering last year with star-studded productions of “In the Heights” and “Chess.” The musicals run for a short time and are advertised as ‘concerts’ rather than full-fledged productions, meaning scaled-down sets and actors that can occasionally be spotted with scripts in hand. “The Music Man” loses nothing for it, retaining all the charm and wonder that a truly amazing show can bring, mostly due to the infectious joyful energy of every single person onstage. “The Music Man” begins as unrelenting opportunist Harold Hill arrives by train in River City, Iowa, looking to sell band instruments and uniforms on the promise of music lessons. His plan is simple: grift the unsuspecting Iowans and skip town before they even suspect his fraudulence. But the presence of savvy librarian and music teacher Marian Paroo complicates things when she sees right through his scheme. Norm Lewis is a household name among theatre fans, perhaps best known as the first black actor to play the Phantom of the Opera. As Harold Hill, one of his self-proclaimed dream roles, his full, soaring baritone serves him well, delightful in beloved quick-talking numbers like “Ya Got Trouble” and in touching ballads like his reprise of “Till There Was You.” Lewis’s Hill possesses more panache than sleaze, effortlessly commanding the stage and convincing River City of his veracity. Both funny and romantic, greedy yet generous, it is a joy to watch him on stage. A Tony winner for her portrayal of Carole King in 2014, Jessie Mueller is warm, confident, and arresting as the Golden-Age leading lady. Her performance is remarkably grounded through some of the show’s best-known numbers, her vocals bringing new life to “Goodnight, My Someone,” and her Marian is never content to take a backseat in Harold Hill’s story. Her dynamic with Rosie O’Donnell, who plays meddlesome Mrs. Paroo, is charmingly bickersome, as O’Donnell, sporting a spot-on Irish accent for the role, constantly urges her to find a man. 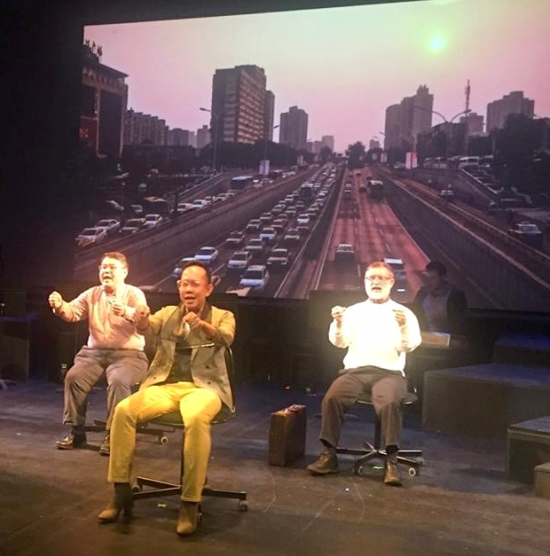 Other highlights include John Cariani’s awkwardly endearing Marcellus and the show’s School Board turned Barbershop Quartet, whose discoveries of their own vocal harmonies are comedic and pleasing to the ears. Throughout the show, the bright colors of the artfully projected backdrop and the whirling skirts of dancers executing endless lifts create an atmosphere of joy and bring the audience back to a simpler time of music and true love. It is productions like “The Music Man” that reminds us why they are called ‘Golden Age.’ Standout performances and swelling music make this production a privilege to watch from start to finish (and be sure to stay until the end of the curtain call). Trust me, when Iowa looks like this, you really ought to give Iowa a try. Running Time: Two and a half hours with one fifteen minute intermission. “The Music Man” runs through February 11th at the Kennedy Center’s Eisenhower Theater, 2700 F St NW, Washington, DC 20566. Tickets are on sale at the Kennedy Center box office, online, or call (202)-467-4600 or (800)-444-1324.